In 2015, Brad joined Flood Communications as general manager. In this role, he oversees the South region (from Nebraska City to Grand Island). Brad actively supports programming, news, sales and office staff. He regularly travels between offices and ensures that goals are successfully achieved. He constantly strives to improve service and to provide a great return on investment for each of Flood Communications’ clients. Brad loves the challenge of operating in multiple media. 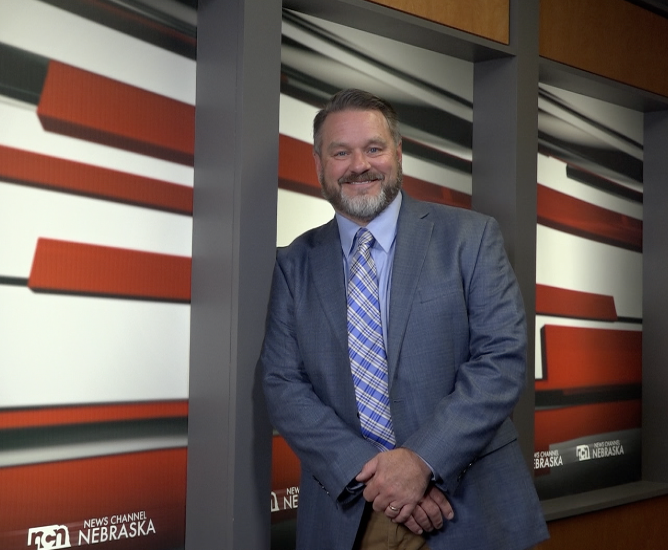 Brad graduated from the University of Nebraska Lincoln in 1990 with a Bachelor of Journalism degree in advertising. Seven radio stations: KFMQ, KYNN, KFGE, KUTT, KWBE, KBIE and KNCY. Four broadcast companies: Midwest Broadcasting, Siebert Communications, Siebert Broadcasting and Mitchell Broadcasting. Brad’s also published his own magazine (Dig Magazine) and owned his own advertising agency (Beanstalk Advertising). Brad is an active member of his community; he served as a board member of the Beatrice Pregnancy Resource Center for seven years. Additionally, Brad donated his time and talent to coaching the Beatrice Bullets, a select youth baseball team. Four children: Brady, Noah, Olivia and Isaias. Outside of work, Brad enjoys Little League Baseball, dance recitals, band performances, Hastings College track meets, music (listening and playing), reading, naps and watching food shows.